This appeared a couple of days ago in the Philadelphia Inquirer. The verb an American would normally use, of course, is “is.” My sense is that the Inquirer’s use of “are” is an aberration, even in coverage of English football. My background is sports reporting in UK papers. The tradition is that clubs are plural on the sports pages and singular on the news pages! Here http://www.independent.co.uk/sport/football/international/world-cup-2014-draw-daunting-draw-but-england-have-nothing-to-lose-against-uruguay-italy-and-costa-rica-8989260.html is an example from a “quality” newspaper. The headline states “… Daunting draw but England have nothing to lose against Uruguay, Italy and Costa Rica “. The traditional rule about collective nouns taking the singular isn’t regarded as clearcut and absolute. It depends on context. Using the plural can be justified on the grounds that “the England team”, commonly shortened to “England”, carries the sense of “the people in the team” and the plural can be used to reflect that where emphasis on the composition of the team fits the context. In other cases, it may be right to emphasise and reflect the collective nature of the entity that is the team by using the singular. I first encountered this about ten years ago when the internet meant I could access the American music press. I found it very odd to read something like ‘Radiohead is playing Coachella’ when, as a group of people not a single entity, ‘Radiohead are…’ sounds much more correct to my British ears. In a lot of English Style books I’ve read, the technical inaccuracy is acknowledged when referring teams in the plural but is acceptable. In my view the team can be referred to in the plural but the club shouldn’t be. For example: “Queens Park Rangers are second in the Championship” is ok as it refers to the team’s performance. “Queens Park Rangers has announced that it will build a new stadiurm” refers to a something the club is going to do and therefore should be referred to in the singular. It is quite correct for BrE collective nouns to take either the singular or plural forms, the former when a single entity is implied – such as “the Arsenal club” – the latter when referring to the component parts – the members of the Manchester City team. It is incorrect to mix both forms within the same sentence. Thus, had the example above been written “City is undefeated”, the end of the sentence would have had to been changed to “…but has won just two of its eight road games” – which sounds somewhat clumsy to BrE ears. Sammy is right; it certainly is not an aberration. If we were required to stick strictly to subject-verb agreement regardless of the meaning of the sentences, we would be required to say “Pride and Prejudice are a good book.” Collective nouns and proper nouns have freer usage than run-of-the-mill nouns, so collective proper nouns should be the freest of all. The collective plural is used in the US constitution. In British English whether a collective noun is assigned a singlular or plural verb is a matter of logic from the underlying thoughts and context. 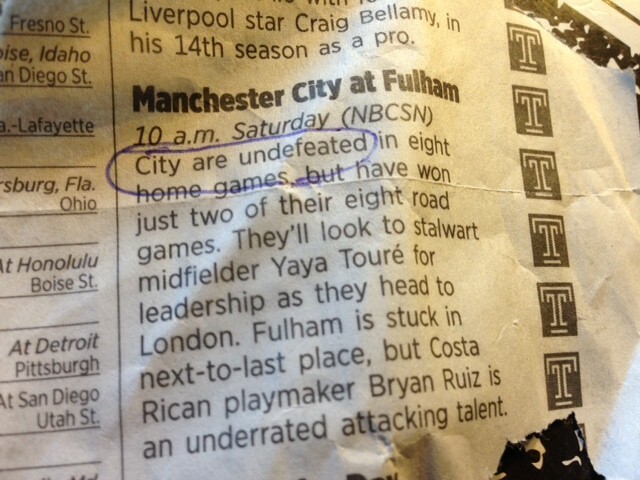 City (the club) is undefeated; City (the players) are undefeated. Parliament (the institution) has passed a law; Parliament (its members) have passed a law. It is not British custom to drop the indefinite article before plural nicknames: fans cheer the Blues (Chelsea); the Dons (Wimbledon); the Rams (Derby); the Reds (Liverpool); etc. Rangers is not a nickname, it is the name of the club, Rangers Football Club, whose nickname is the Gers. Spurs is not a nickname per se but a shortened version of the club name Tottenham Hotspur. Band names in British English seem to be used with a plural verb quite regularly. “Queen are a band …” comes to mind as the first time I noticed it. To go off on a tangent, our teams play ‘away games’, not ‘road games’, so he didn’t go full-on British. I am English and acknowledge that the usual convention is to refer to clubs and other groups as plural, but usually only when using the word to describe the players as a group. Thus: Manchester City is a club in the Premier Division but Manchester City are winning the game 1-0. However, British media style guides seem to mandate that all instances should be plural, which often results in slightly strange constructions even to my eyes.